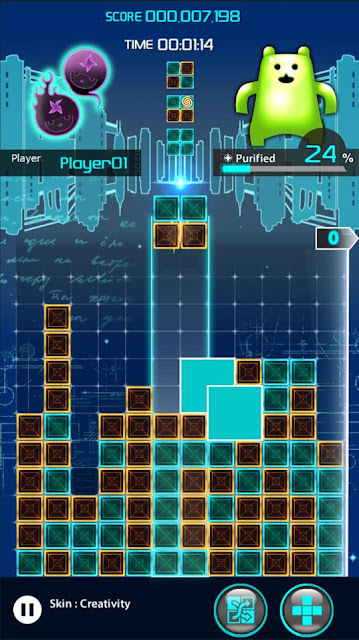 When I think on underappreciated game franchises, Lumines is right up there. After a successful debut on PSP and more muted PS3 and Xbox 360 digital releases, the series landed on the criminally underperforming PlayStation Vita at the launch of the console and… well, that’s it, actually. Of those, only the PSP release could be said to have a significant profile. Hopefully this new iPhone game helps to raise the profile of the franchise, because it really is one of the better puzzle game formulas going around. 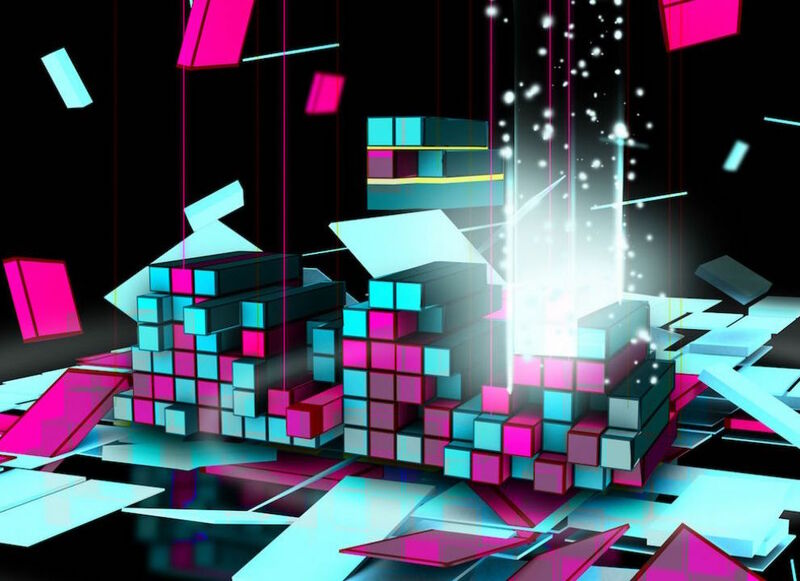 Related reading: Matt's review of Lumines: Electronic Symphony on the PlayStation Vita. Lumines is a little like Tetris on the most basic of levels. Players are working with blocks, made up of four small squares, that come hurtling down from the top of the screen, and each square is coloured in one of two colours. Your task is to make those colours form into squares at the bottom of the screen, which will make them disappear, and prevent the squares from reaching the top of the screen. Where Lumines is really innovative is that it’s also a rhythm game. Across the playfield, a line moves from left to right, as a visual representation of bars of music. The matched up blocks only disappear as this line passes through them. To do well at Lumines and get high scores, you want the line to remove a large number of blocks with each pass across the screen that it makes, and then do the same thing for a number of sequences after one another, because that’s what builds up the combo meter. In other words, not only do you need to remove blocks, but you need to build a rhythm into how you do so. This is an abstract system, but it’s really quite visceral in practice, as it turns music into a physical thing that you’re interacting with. Lumines’ music library offers a wide range of different musical styles, with each track having a very different aesthetic and rhythm. You’ll develop favourites, but more importantly, once you’re comfortable with the mechanics, you will find yourself adopting different play styles to each of them, perhaps without even thinking about it, because you’ll feel like you’re “in” the music. 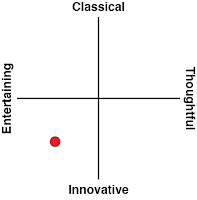 For example, if the music has a slower tempo, I’ll find myself playing more riskily. I’ll build up large stocks of blocks to try and set up long combo chains. Because I have more time with the rhythm, I’ll go into that particular dance hunting for points. But faster music? Well, with faster music I’ll dance like I’m doing the quickstep, and flick my finger around like crazy to try and keep the blocks to a low, manageable level. The vibrancy of Lumines is so key to its appeal. While the presentation is clean, each track also has rich backgrounds and a kaleidoscope of colours that really suit the music track itself. 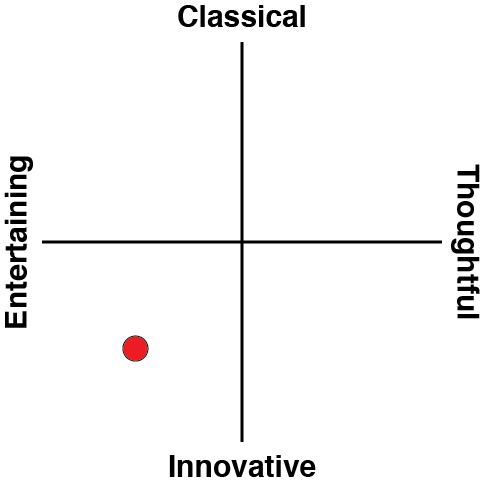 The music itself is also tonally rich, and you’ll want a good set of headphones to really enjoy this one if you can. For the iPhone Lumines the actual track list is disappointingly thin at this stage. With only slightly over a dozen music tracks, the range is more limited than I remember any previous Lumines game being, and more critically, this track list lacks some of the awesome licensed music that previous games featured. The Vita game had the Chemical Brothers’ Hey Boy, Hey Girl, for example, and that was a mind-blowing experience all in itself. What a perfect piece of music for a rhythm game. I would bet significant money that the game will have DLC tracks added in via future updates, and while I don’t hold that against the game (and don’t think it’s an expensive path to go, as the base download is quite inexpensive anyway), it would have been nice for the base game to have one or two “marquee” music tracks to really whet people’s appetites for more. Play modes are fairly limited, but address the main ways that people would want to play anyway. There’s the option to play an endless score attack on any single track, or alternatively there’s an objective-based mode where you’re looking to maximise your points across a number of tracks. By matching up blocks you’ll slowly fill up a meter, and once filled that meter will cause the music to transition to the next track. To pass this mode you need to get through all the tracks without causing a game over, at which point you’ll be awarded stars based on how many points you secure in the process. A nice touch is how social the game is, allowing for easy recording of footage and sharing over social media. 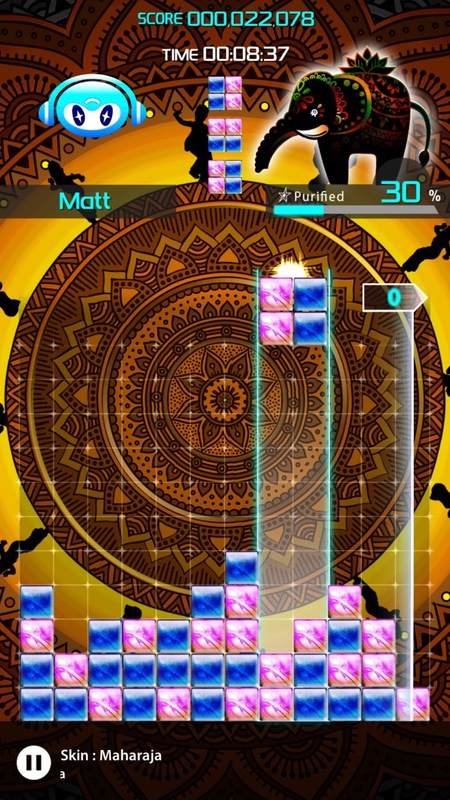 Because of the complex interaction between puzzle game and music, Lumines is the kind of game where players can show of real, genuine skill in being good at the game, so the competitive edge that this social sharing adds in actually gives the game genuine long-term value for the really competitive. 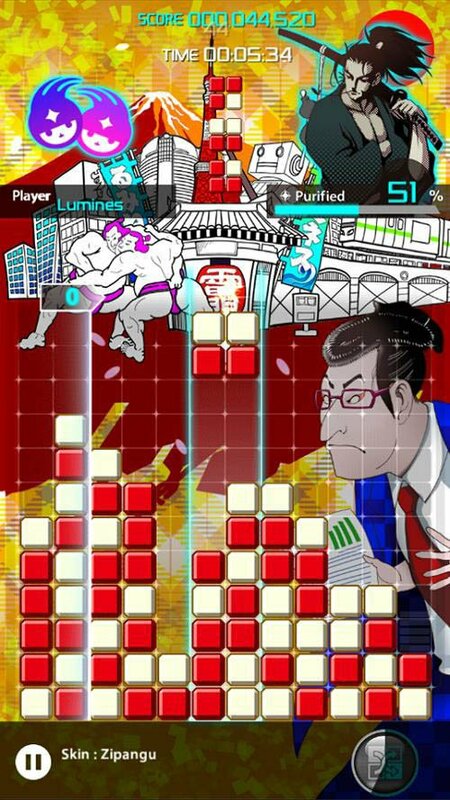 Lumines is a perfect game for the iPhone, because the gameplay really is built around short sessions on the go. It would be nice if there was more of it at this stage, but it’s only in a soft launch state in a couple of territories at the moment. The developer hasn’t even translated all of the text – Japanese characters keep popping up on my screen (though the main navigation and UI text is fully localised). Related reading: The top ten rhythm games available on current consoles. I would be deeply surprised if there wasn’t more content planned for the game. Even though the iPhone is absolutely saturated with the music/rhythm genre, and does games in the genre better than almost any platform, Lumines is right up there with the best of ‘em.